Why has Malaysia blocked Medium? A Southeast Asian scandal gets Twitter founder's publishing platform censored. Medium is a popular platform, offering amateurs and professionals alike a simple way to publish their articles. This week, it was blocked in Malaysia. Over a single article posted by Sarawak Report. Sarawak Report is a London-based site that investigates government wrongdoings in the East Malaysian state of Sarawak. Over the years it's been a beacon of investigative journalism in the country, shining a light on the construction industry, the media and, more recently, the alleged corruption of Malaysia's Prime Minister Najib Razak. Najib is the leader of the Barisan Nasional party, which has been in power since the country gained its independence from the UK in 1957. The site uncovered misappropriation of funds, alleging that a government-owned development company had channeled huge sums of money into Najib's personal account, and that the fund was also used for bribery. The allegations eventually triggered an official investigation into potential corruption. 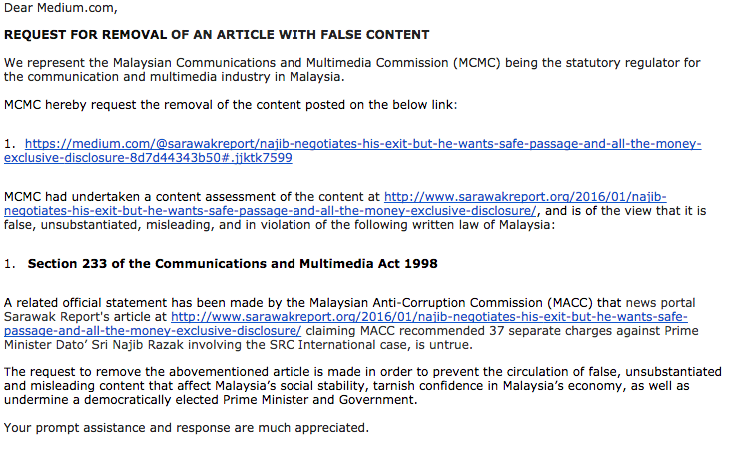 Last summer, at the height of the scandal, the Malaysian government blocked the Sarawak Report website. After the block, Sarawak Report began posting some stories to Medium, meaning that Malaysians could still see what their government was allegedly up to. The government investigation into Najib's finances concluded earlier this week that the money was "a gift" from the Saudi royal family and no wrongdoing had taken place. Critics decried the decision, sources say the country's Attorney-General ignored a recommendation to charge Najib and anti-corruption officials are asking for a review. It's likely the scandal will continue for months if not years to come. Medium responded asking for the MCMC's evidence that Malaysian law had been broken, and also a copy of the Malaysian Anti-Corruption Commission's statement that the allegations were untrue. Rather than sending a response, Malaysian officials blocked the site. Despite censoring smaller sites in the past, the blocking of Medium in its entirety is a huge leap from the censorship of the past. Even China, notorious for its tight control over what its citizens see, does not block the site. Najib's popularity has dwindled in recent years. Although his party won a 133-to-89 seat majority in 2013, it lost the popular vote and has been accused of gerrymandering to win. There have been widespread calls for electoral reform, but the leader continues to defy critics and appears to be tightening his grip on power. Because of this, there's a fear that other sites hosting dissenting information could soon be blocked as well. Medium says it "stands by investigative journalists," and won't remove any posts until it receives an order from "a court of competent jurisdiction" to do so.